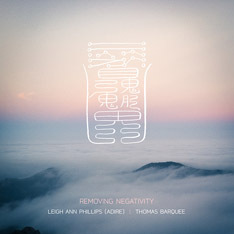 Leigh Ann Phillips’ sound healing work for those with cancer is based upon the Fabian Mamon’s scientific research of dissonance and harmonic intervals and their effect on cancer cells. According to Mamon, when musical scales are played progressively, on or near the body, the harmonic resonance impedes the ability of cancer cells to hold their frequency, and begin to break apart. As well, DNA has been found to be extremely sensitive to musical frequencies. When humans get sick, they have in effect “gone out of tune”, just as musical instruments do. Sound Healing as a complimentary therapy “retunes” the body to a more aligned harmonic vibration and rhythm by allowing the body and brain to absorb these resonant sounds. 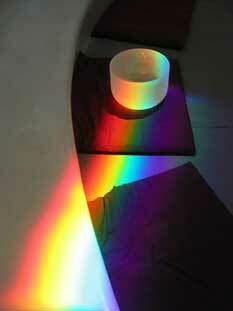 This “vibrational massage” amplifies and spreads healing harmonic patterns throughout the body and brain. Based on the twin principles of harmonic resonance and quantum entrainment, the body literally matches up with these healing and harmonic tones, thus re-establishing a naturally healthy vibration on a cellular level. 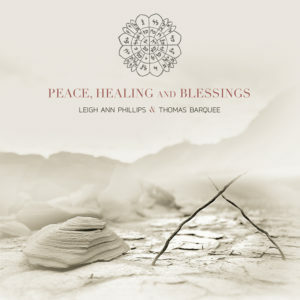 The music of Leigh Ann Phillips includes harmonic overtones and the sounds of the quartz crystal singing bowls – music that not only sounds beautiful to the ears, but can also be beneficial to the body, mind, and spirit. Leigh Ann Phillips has developed a method of entraining the brain states and allowing vibration to enter into the body via bone conduction as well as brain wave entrainment with the use of quartz crystal singing bowls made of not only pure rock quartz crystal, but other gemstone and minerals such as ruby, emerald, amethyst and diamond. There are many benefits from incorporating this type of sound therapy. It can alter cellular functions through energetic effects. It can calm the mind, and therefore the body, bringing more mind/body unity. It can release emotions from the body, which effect neurotransmitters and neuropeptides. Sound can also enhance the immune system. The increase of T-helper cells can occur from the use of the quartz crystal bowls by increasing alpha and theta brain wave states, influencing the brain-body nexus. There is also compelling scientific research from Fabien Maman that demonstrates when cancer cells were exposed to musical scales, the cancer cells disorganize very quickly. Basically the cells die because they are not able to accommodate its structure and synchronize with the accumulation of sound. The other extraordinary gift of sound is when the actual vibration of the sound can penetrate the body. Dr. Jeffrey Thompson D.C. has done research showing that frequency and vibrational intensity can heal at the cellular level. Because the human body is over seventy percent water and since sound travels five times more efficiently through water than through air, sound frequency stimulation directly into the body is an extremely effective way of totally body stimulation, particularly at the cellular level. Another benefit to this type of work is the release of emotions that keep extra energy blocked in the body. Trauma does not have to be relived to be released. Some trauma is so deep that it cannot be verbalized. 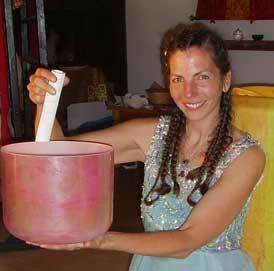 Sound therapy is a powerful form of somatic work. This can speed up the recovery process, as well as mitigate chronic pain problems, from headaches,back, neck and shoulder as well as side effects from radiation and chemotherapy. Leigh Ann's crystal bowl music has been utilized in the B.E. A.L.I.V.E. audio program of Evicting Cancer by Susi Roos.